We are extremely blessed to be able to travel in our family. Last summer we (my mom and I) took the kiddos to France. We split our time between Nice and Paris. I wasn't sure how they would like it but they loved it (so much so, we are going back this summer). The princess taking in Nice. 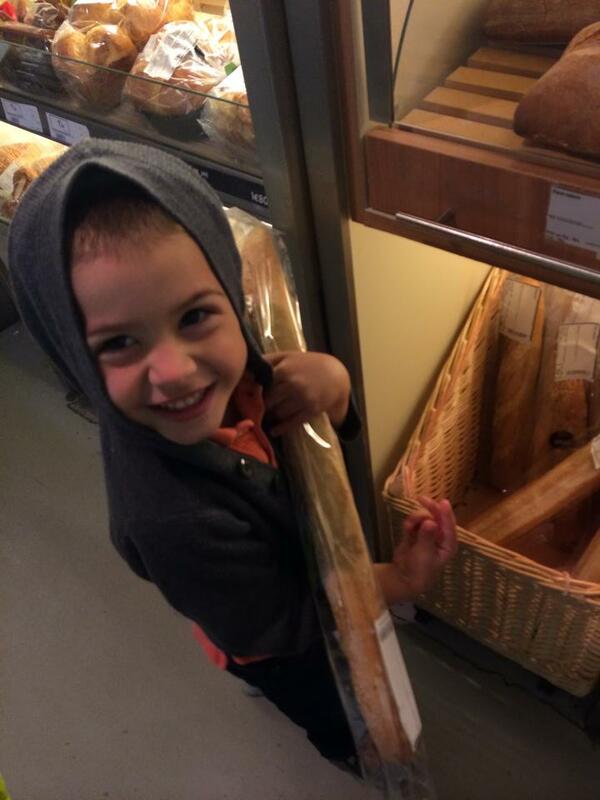 Little man grabbing his fave - baquette! After spending a couple of weeks in France, they were already picking up a bit of the language so when I decided that I wanted to add something to "cuten up" the door, incorporating French was a must. Unlike most projects, I knew instantly what I wanted to do. I headed to Hobby Lobby, picked up a few supplies and knocked this one out quickly. I grabbed a bunch of letters, magnetic tape and spray paint and headed home. I noticed that the edges of the letters were a bit rough so I sanded them up and then spray painted them white. After they dried, I applied magnets to the back using hot glue. Why magnets? Our front door is metal so the magnets work great. If you have a wooden door, strong double-sided tape would work great (although I would be nervous to tape something to a wooden door). Although the magnetic tape was, well, tape, I wanted to make sure there was a good bond between the magnets and the wooden letters. You need to make sure and put a magnet on both sides of the larger letters or the magnets will pull to one side. The only thing left to do was attach them to the door. For those who know the French language, I know I cheated by not putting the accent marks on but, tried as I may, I could not recreate them with the wooden pieces I had. For those who don't speak French you probably are wondering why I chose à bientôt over the typical au revoir. I prefer "see you soon" to "goodbye." My daughter loves it and little man tries his hardest to say it. I love that it gives a bit of character to the door while telling our guests we hope to see them soon. I hate spam. You hate spam. I also hate getting a ton of emails everyday. Sign up and you will receive a weekly recap of this week's posts. Just one email, once a week. No muss, no fuss. Just the way I like it. We respect your privacy and will never give your email address to anyone. That's just not cool.